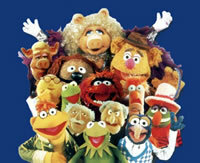 The Muppets Personality Test - Which Muppet are you? Find out which character from The Muppets you are most like with this test! For each question, select the option that best describes your personality then click the Who Am I? button at the bottom of the page. 4. An aptitude for science? 6. Good at telling jokes? 7. A good singing voice? 10. Did you like this test? Yes, thanks It was terrible! If you come back and take the test again, be sure to hit the Start Again button to reset your previous answers!